This month, Duggan reached out to U.S. Sen. Gary Peters, D-Bloomfield Township, Bridge learned from six sources with knowledge of the effort, including three party officials. In a January meeting described by one observer as a “full court press,” Duggan, United Auto Workers President Dennis Williams, other union leaders, and powerful Detroit pastor the Rev. Wendell Anthony tried to persuade Peters to enter the campaign, promising substantial help with fundraising, the sources said. Kildee declined further comment. Peters, a first-term U.S Senator, issued a statement late Monday through his communications director that did not specifically address his recruitment for the governor's race. "Senator Peters is focused on his job as a United States Senator for the people of Michigan and will not be running for Governor," Amber Moon, his spokeswoman, said in an email. Williams, whose union represents 400,000 active auto workers, confirmed through a spokesman he attended the meeting with Duggan and Peters. “It was a great meeting. We talked about issues that affect Michigan and the United States,” Williams said, declining further comment. The existence of the recruiting campaign, described by one as “the worst-kept secret in town,” highlights growing concern among Democrats with Whitmer, and shifting currents within the state party less than 10 months before the election. Last year, a string of high-profile Democrats opted out of the race for governor, hoping the party would unite around Whitmer of East Lansing, the state’s former Senate minority leader. RELATED: You asked. We listened. Bridge boosts Lansing watchdog team. “The bottom line is, because of polling numbers, Gretchen is (perceived as) not very strong in southeast Michigan, and the fear is if you can’t win in Macomb County or Detroit, you can’t win,” said pollster Ed Sarpolus, executive director of the Target-Insyght firm in Lansing. The worry among some Democrats is that, even if Whitmer were to prevail, it would be a low turnout election and hurt the party’s chances in other state races in November, Sarpolus said. “We have seen an enormous level of excitement across the state: unprecedented fundraising; volunteer signups; I’ve been to 50 out of the (state’s) 83 counties,” Whitmer said following an event in Center Line in Macomb County. Michigan Democratic Party chairman Brandon Dillon did not return a message seeking comment Monday. Whitmer isn’t the only Democrat in the race. Also campaigning are Abdul El-Sayed, Detroit’s former health department director; Ann Arbor businessman Shri Thanedar and businessman Bill Cobbs. Republican candidates include Attorney General Bill Schuette, Lt. Governor Brian Calley, state Sen. Patrick Colbeck, and several others. For Democrats, the upheaval isn’t exactly new. Similar, behind-the-scenes recruitment efforts preceded campaigns of Jennifer Granholm in 2002 (she won), and then-Lansing Mayor Virg Bernero in 2010 (he lost). But several high-profile Democrats told Bridge they’d hoped for smoother sailing this year, considering Republican President Donald Trump’s low approval ratings and outgoing, term-limited Michigan Gov. Rick Snyder, whose second term and overall popularity were battered by the Flint Water Crisis. “It’s a mess right now. Honestly,” said one Democratic leader from southeast Michigan. Like others in this article, he has participated in party discussions concerning Whitmer but spoke to Bridge only on background, citing the sensitive nature of the behind-the-scenes maneuvering. At least three Democratic leaders who spoke to Bridge used the same phrase in discussing Whitmer’s campaign: “It hasn’t gained traction.” Two others described a “lack of enthusiasm” they fear would depress turnout. “The feeling among Democrats with Whitmer is ‘I’m going to fall in line. I’m not going to fall in love,’” one high-ranking Democrat from suburban Detroit told Bridge. Steve Hood, a Detroit political consultant, said the discussions reveal overall frustrations with what he called Whitmer’s “lackluster” campaign. Whitmer, a former member of both the Michigan House and Senate, is running on traditional Democratic causes – expanding jobs, women’s rights, protecting the environment and improving infrastructure. During the Monday event, she described herself as a fighter and strong advocate of teachers. Heaster Wheeler, the former director of the Detroit NAACP, said any jockeying and “robust debate” within the primary may sharpen Whitmer’s performance for a bruising general election. “There’s going to be a lot of conversation as to who is going to be the (nominee) and it’s far from a foregone conclusion,” Wheeler said. Indeed, election history shows that Democrats from outside the Detroit region have difficulty in governor’s races in Michigan. The last one without Metro Detroit roots: William Comstock of Alpena in 1932. In the past half-century, Michigan has elected only two Democratic governors, Jim Blanchard of southern Oakland County and Jennifer Granholm, who was general counsel to Duggan’s former boss, the late Wayne County Executive Ed McNamara. Blanchard lost-reelection in 1990 to Republican challenger John Engler in large part because of depressed turnout in Detroit, stemming largely from then-Mayor Coleman A. Young’s dissatisfaction with Blanchard. Others in the party and political operatives said the movement not only reflects divisions between southeast Michigan and outstate, but whether women candidates are still being held to an unfair standard. Whitmer told Bridge she’s happy with polling numbers and is “going toe-to-toe with a Republican who has been running since 1984,” referring to Schuette, a former congressman. A December poll by EPIC-MRA showed Schuette with a 3 percentage point lead, a statistical dead heat. “Name ID is going to be built quickly, and we have a lot of exciting things in the works,” Whitmer said. Several polls show Whitmer has a double-digit lead over others in the Democratic primary, and November poll from Target-Insyght showed she had a sizable advantage over hypothetical candidates including Duggan and Southfield attorney Geoffrey Fieger. Whitmer also has a fundraising edge, raising $3 million through 2017, compared with Schuette, who took in $2.3 million. Pollster Richard Czuba said he senses sexism is at the heart of any talk of finding new candidates. Czuba said any man entering the race now could backfire because of growing enthusiasm “amongst women who are wildly moving toward the Democratic side” nationally since Trump took office. Independent voters are “re-engaged and energized” by the Women’s March in January 2017 and scandals involving Trump, Czuba said. He pointed out that, at this stage in 2014, Democratic gubernatorial candidate Mark Schauer was trailing by a wider margin and there was “no conversation … of replacing” him,” Czuba said. Whitmer laughed when Bridge asked if she thought sexism was at play, saying she’s “not going to guess” about the motives of any possible opponents. I went to hear Witmer speak at least a year ago. She was focused, intense, energetic , and had everyone on their feet applauding. She is experienced, ethical, and worthy. She is experienced, ethical, and worthy? Is there such a thing as an ethical democrat? And then the worthy thing? Ahhh, what is that all about? Why is she worthy? Because she is a woman? The whole idea should be about competency. That, the lady is not. She is a democrat and that folks, tells the whole story. The only problem is her voting record. She votes too much along republican lines. Great job ignoring the fact that we have another amazing candidate running - someone who can easily beat Whitmer AND Scheutte: Dr. Abdul El-Sayed. His education, history of public service, and career are far more admirable than those of all of the other candidates combined. He's exactly what Michigan needs right now, a legitimate Anti-Trump in a state that desperately needs a smart, capable, exciting leader again. I couldn't agree more! Whitmer votes too much along repub lines for my comfort. EL-Sayed is my choice too! Just what we need -- another egotistical male who claims he has all the answers but has zero experience in governing or legislation. </sarcasm> Thanadar is an A-square wonder but how does he play in the UP? What loyalty has he earned from our farmers? Isn't he just a blue Gateway wonder? Sorry boys - my money is on Whitmer. There absolutely was discussion about getting a different candidate when schaur ran. Yes, let Jennifer run. The last thing Michigan needs is another democrat in the governor's office. 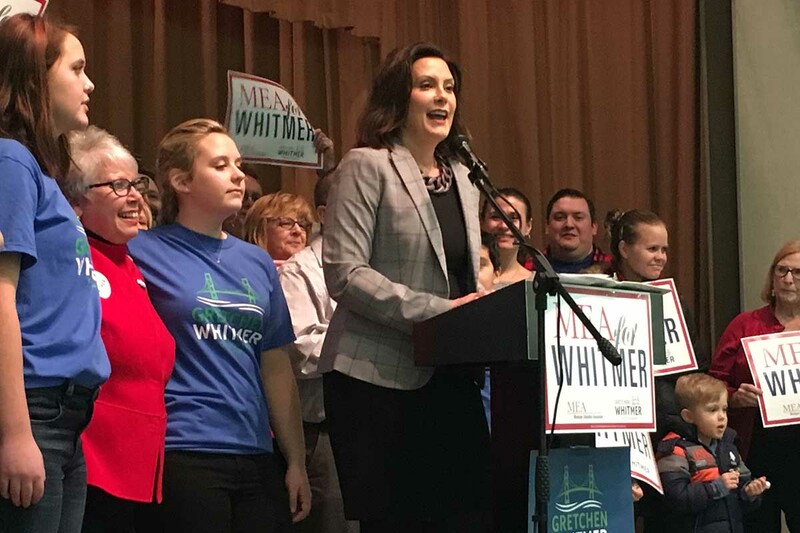 Regardless of whether there is gender bias being a driver in the effort to seek an alternative to Whitmer, it certainly will be seen that way by a lot of female voters. In addition, there is no reason whatsoever to think that turnout will be depressed this year, particularly if the Dems get their act together. Between disgust with Trump and the overall ineptitude of state government under Snyder and the gerrymandered legislature, the voters are should be primed for change. Moreover, the initiatives on gerrymandering and marijuana should further prime the pump and draw folks to the polls who might not otherwise be as enthusiastic about voting. This is BS. If she is not well known, put some effort into helping rectify that. If there are other qualitfied candidates fine, but they don't have to go looking for them! Gretchen Whitmer is a very qualified candidate and working against her for the reasons stated is arrant sexism. Why won't dems back El-Sayed? Are they afraid of progressives? Because Gretchen IS a progressive! She lead the original resistance to the republicans in the legislature. Where was Abdul when RTW passed? God, this is so sexist. Let's recruit another boy from the boy club because the boys are better known. Not, let's get her name out and help her. Let's stick with the union orthodoxy. Powers, you're adding to the BS about her. She can beat anyone the Rs field. You know it would be better for Michigan. But you chose to torpedo her with nonsense. I'll tell you what, boy Dems. Let her make a viral video about penises and she'll do it all without you. I have no strong feelings for Whitmer one way or another. For me to be enthusiastic about any Democrat's campaign at this point, though, she/he would need to strongly move beyond the safe traditional Democratic issues and stands. She would need to take a definite stand for economic opportunity. She needs to be a strong populist voice that is willing to accept the help of the party establishment (& traditional allies) while being visibly independent of them. In short, she should be willing to raise a little hell. Ah, where to start? First off, no one is being fooled by the accusations of sexism. We've had a woman as governor (twice elected); clearly this state is not incapable of supporting a female candidate. "Year of the Woman" you say? "I'm With Her"? That tactic didn't play well in 2016 either. Moving on, I would point out that polling data in MI, such as it is, is pathetically inadequate. Hence the huge upset in the Dem presidential primary (polls missed by 20+ points). Consider that the most recent EPIC-MRA results, cited here and in every gubernatorial article I've seen since it was published, are based on a measly 600 respondents! In a state with 7.5 million registered voters-- what a joke. Furthermore, such polls are clearly biased by focusing exclusively on only two of the declared candidates (Schuette/Whitmer). Yet somehow Fieger and Duggan find their way into the questionnaire as well-- what a joke. Regarding name recognition, can the Dems PLEASE give that excuse a break. If Whitmer is the de facto "front-runner" and has campaigned in 50 counties over the past 12 months, that no longer holds any water. It's the 21st century; anyone with access to the web can find out who ALL the candidates are in approximately 0.74 seconds. Just because people aren't excited about her doesn't mean they've never heard of her. In fact, I suspect that the opposite is true-- there's a lack of excitement because we HAVE seen what she has to offer, and it falls short. Schuette looks like an Engler rerun (worst roads in the country, colapsing infrastructure blew the rainy day fund on a tax cut before a recession, we wound up with an increase due to bad management), and if you look at the job description he has been a lousy AG. Whitmer needs to show us that the is not a Granholm rerun (Unionizing home care providers without a vote, indecisive, unable to lead the legislature to accomplish much of anything) or we may have a "Trump" type running Michigan. I believe Shri Thanedar has a Great resume and I love the bonuses he gave his employees. He gave $3.3 million to 50employees what an awesome Boss.I do believe as in the article Gretchen sounds programmed like a robot. Let's get to the point. Detroit Politicians (Duggan/Anthony) DO NOT get to tell the rest of Michigan who should run for Governor. First, if this is a Test for former EAA Secretary, now "Mayor" Duggan for Governor, a LARGE voting bloc outside of Detroit says, "Heck No". As for Anthony, he should be worrying about the Taxation Without Representation of Conyers old seat in the 13th District -- instead of trying to tell Whitmer or the other Democratic Governor Candidates what to do. Isn't a seat being left open without a Congressperson for nearly a year, a Civil Rights Issue? Next, this is a Democratic Primary Race and the People will decide which of the four candidates they deem strong enough to beat Schuette-Not-On-Duty. Until then, all the backdoor talk needs to cease and desist. Gretchen Whitmer should have ran for governor in 2014. She was doing things at that time which gained exposure in the Detroit area. That luster has faded. She had a dieing mother and teenage kids to raise...so she felt she had to drop out in 2014. People want to smear Gretchen. Cuz they think she is weak. I don’t think she is. And Style is not what I am voting for. I am practical. The best choice is GW. Everyone else has to imagine what needs to be done to fix Michigan. She is the only one that fought in the state legislature as a Dem Senate leader. She knows what got messed up first hand and knows what to fix. Its easy to say stuff. But where were the other candidate when RTW was being passed? GW was in the middle of the capitol dome floor that was filled all the way up with protesters because she opened the doors. She pushed capitol police away who thought she needed assistance. She said no, I’m with the people. What were the other candidates doing when it came time to exercise their civic duty to vote? Hmm not sure on some candidates. Talking about waiting for some great white male savior is insulting. I truly think Duggan is a racist. This insistent attitude to have a person that the DNC can control has to stop. She is a pretty good canidate, but the party needs to stop ignoring the future, the progressive movement will hurt the working class. She should reach out to one of the progressive candidates and work to bring a message that we insure that a progressive is their lieutenant governor. This will rally the party, not just the base. Mayor Duggan is not supporting Gretchen Whitmer because she is not supporting his short sided attempts to end Michigan No Fault Insurance. Whitmer supports improving the Michigan insurance system and fixing the unfair insurance premiums for Detroiters by holding insurance companies accountable and maintaining state oversight of insurance companies in the way they set premiums. Duggan is going along with the insurance companies plan and is not sticking up for Detroiters.